Created by Joss Whedon as a space western, and first broadcast on September 20th, 2002, the television show Firefly developed a huge following, even though it lasted just one season. The lead actor in the show was Nathan Fillion, who played the character Captain Malcolm ‘Mal’ Reynolds. In early June at the Phoenix Comicon 2014, Nathan Fillion was asked by an audience member what episode he would have wanted to make, had Firefly gone on for more than one season. The clip above was edited from the full panel discussion that Nathan Fillion participated in at the Phoenix Comicon 2014. The panel discussion was recorded by Nai Wang and you can watch the whole video here. 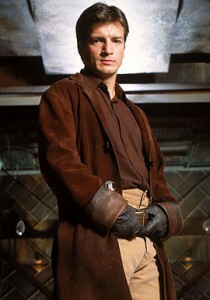 This entry was posted in Firefly, Nathan Fillion, Videos. Bookmark the permalink.